The Durham leadership program was very busy in November and December. 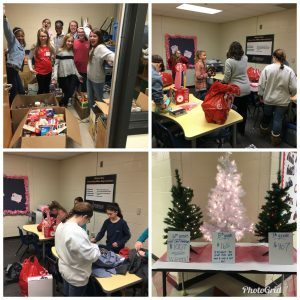 The kids lead a food drive that collected close to two thousand food items and gift cards for the Center for Family Resources in Cobb county, Georgia. In addition, they were able to collect enough money to provide a great Christmas for four families in the Salvation Army’s Angel Tree program. This was the result of great student-lead planning, responsibility, and determination. What a success!